Erected/by/CATHERINE/& MARION MACKENZIE/in memory of/their beloved mother/MARGARET MATHIESON/who died 24th may 1872/aged 78 years/LUDOVIKCK MACKENZIE/died 2nd Jany [...?] years/JAMES MACKENZIE/aged 4 years/MARGARET MACKENZIE/aged 25 years/CATHERINE MACKENZIE/died 18th June 1907 aged 72 years/JANET MACKENZE/died 18th May 1910. Margaret Mathieson MacKenzie was born on the Isle of Skye, Inverness-shire, Scotland. The age of death stated on the stone suggests a birth date about 1794. Census records suggest the dates 1797 and 1801, the locations Stratharid, Strath, and the Parish of Snizort, all then in Inverness-shire. The reference to "Strath" may refer to the Parish of Strath and Sleat or to the village of Strath in the south of the Isle of Skye, abandoned during the Clearances. Added by Gordon J Callon on 25 May 2016. Ludovick MacKenzie: Census records suggest a date of birth between 1794 and 1796, at Stencholl or (more likely) Snizort, Isle of Skye, Inverness-shire, Scotland; death was after 1871. Catherine MacKenzie: Born about 1835. 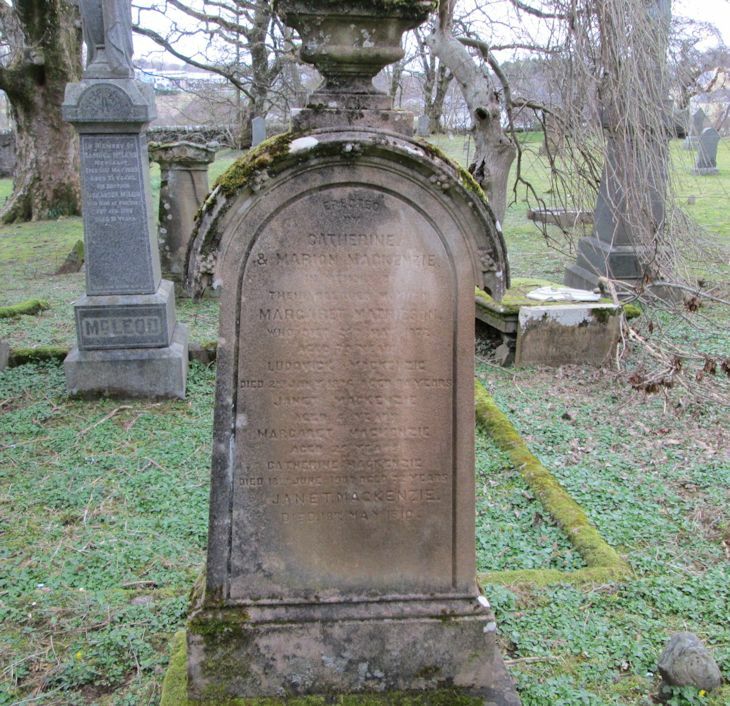 Although the 1851, 1861, & 1871 Scotland Censuses list the family living at Carbost, Snizort Parish, Inverness-shire, Catherine MacKenzie appears in none. A Mary MacKenzie, b. 1834–1835 at Snizort is listed with the family in the 1851 and 1861 censuses. Perhaps Mary MacKenzie and Catherine MacKenzie are the same person, since Mary MacKenzie is not named on this stone (though she may appear elsewhere). Janet MacKenzie: Born 1832–1835, Snizort, Inverness-shire, Scotland. 1871, at Carbost 4: Lodowick McKenzie, 77 (b. c. 1794, Parish of Snizort), Farmer 4 Acres; Margaret McKenzie, 70 (b. c. 1801, Parish of Snizort), Farmer Wife; Janet MacKenzie, 36 (b. c. 1835, Parish of Snizort), General Servant; Malcolm MacKenzie, 32 (b. c. 1839, Parish of Snizort), Laborer; and Lodewick Nicolson, 3 (b. c. 1868, Parish of Snizort), Grandson. Ludovick MacKenzie died 5 January 1875 in Carbost, South Snizort. (Death Record). His wife Margaret Matheson died 26 May 1872 (Death record). Mary MacKenzie married John Nicholson in 1864 and was the mother of Lodewick Nicholson. Added by Mary Darroch on 01 February 2017.